A half-mile north of the Oconaluftee Visitor Center (and Mountain Farm Museum) on Newfound Gap Road (US 441) in the Great Smoky Mountains National Park is Mingus Mill, just a few miles from Cherokee. Built in 1886, this mill uses a water-powered turbine instead of a water wheel to power all of the machinery in the building. Located at its original site, Mingus Mill stands as a tribute to the test of time. It was the largest mill in the Smokies, serving about 200 families. It's one of many historic structures that have been saved. A miller demonstrates the process of grinding corn into cornmeal. 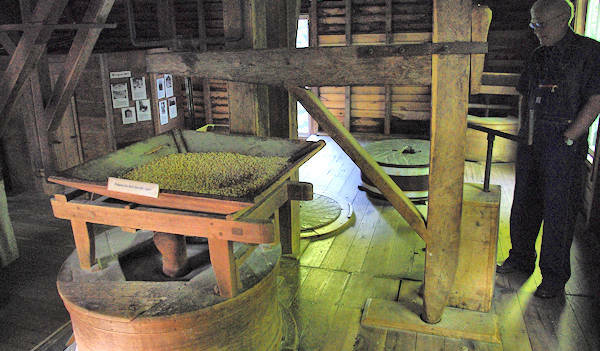 Cornmeal and other mill-related items are available for purchase at the mill. While the site is open all year, the inside of the mill is open 9 AM-5 PM daily early-March through early-November. 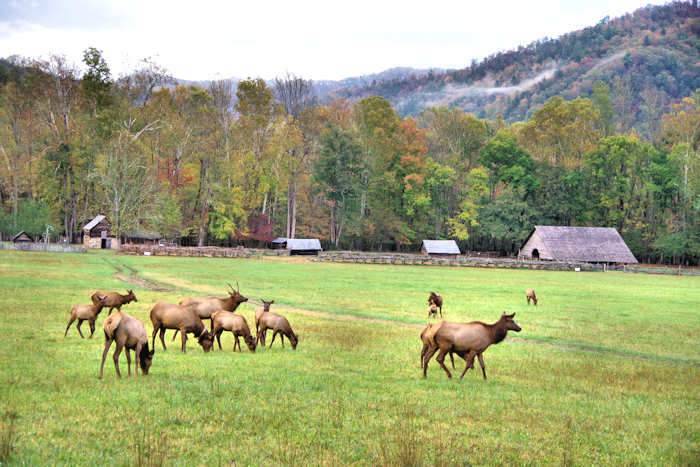 Just three miles from the Oconaluftee Vistor Center is Smokemont. It was once a thriving lumber town with homes, businesses and a school. When the lumber played out people moved on and the area became a part of the National Park. Smokemont Baptist Church (also known as Lufty Church) was built in 1912 for a congregation organized in 1836. The church remained in active use until the area was made part of the national park in 1935. 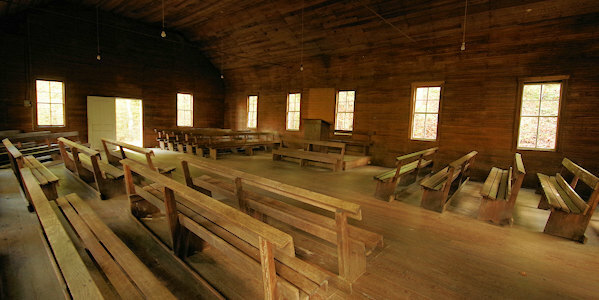 The church has been restored and is usually open to see the interior with the original pews. 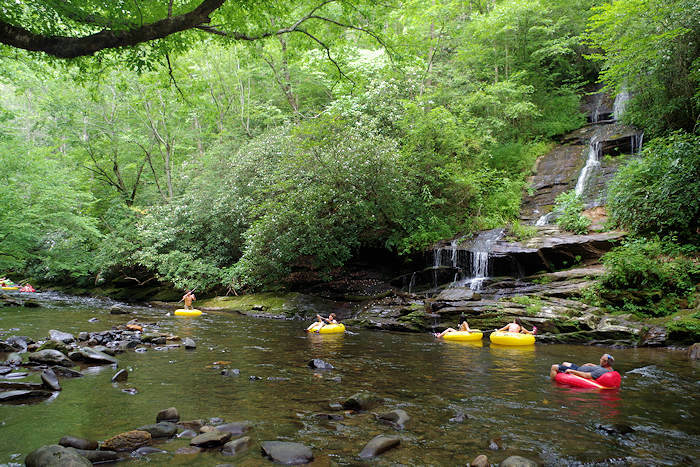 Today, Smokemont offers a large campground for tents and RVs, trails and horseback riding. As you enter the Smokemont area from US 441 / Newfound Gap Road, turn left for the campground, right for the horse stables, or go straight into a small parking area for the short walk to the church. 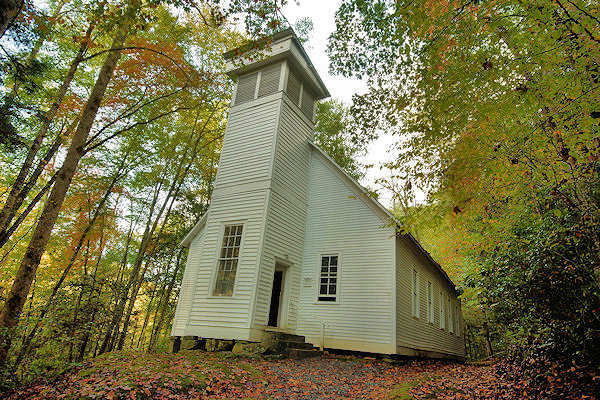 Both the mill and church are wedding locations in the Great Smoky Mountains. Read more about getting married or eloping here. Hikes: The Mingus Creek Trail (5.7 miles total) starts at the mill, so you can hike as far as you want and turn around. The first mile follows an old road and the Mountains-to-Sea Trail. Continue another mile to a pioneer cemetery. The Smokemont Loop Trail begins near the church and returns to the area at the campground. The 6.5-mile hike climbs 1,440 feet in elevation. Directions from Asheville: About 52 miles from downtown, allow 1.5 hours to travel. Take I-40 West to Exit 27. Follow Highway 19/23/74 for about 4 miles and exit onto Highway 19 toward Maggie Valley. About 3 miles past Maggie Valley, watch for the Blue Ridge Parkway entrance, and go south. The Parkway ends at Highway 441. 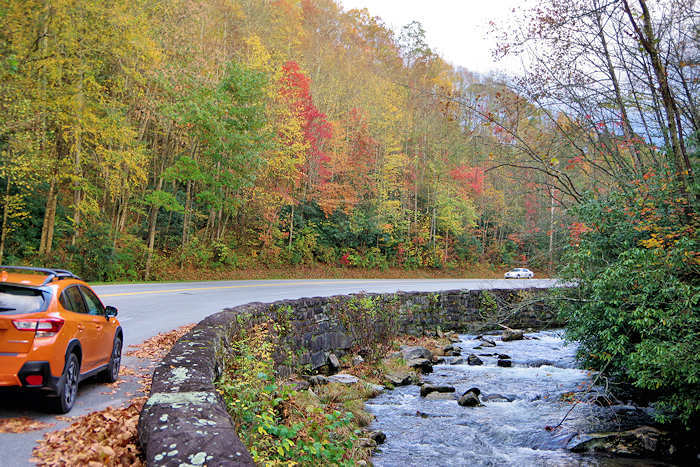 Turn right and you'll see the national park entrance (and Oconaluftee Visitor Center and Mountain Farm Museum). The Parkway is closed much of the winter. If the Parkway is closed, continue on Highway 19 to Cherokee and follow Highway 441 North.Go a half mile past the center for Mingus Mill and about 3.5 miles to Smokemont. 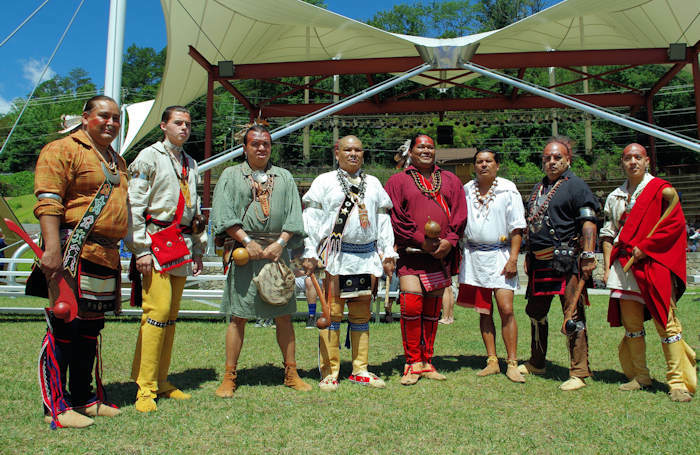 Read about more things to do in the Great Smoky Mountains National Park on the North Carolina side and Cherokee.